There once was a new mum called Mrs Lighty, who had no idea what she was doing and even less of an idea about how to feel about being a mum. Tired, hormonal, overwhelmed and anxious, this new mum would often think about the life she’d left behind her, a life whereby all she had to consider was herself and Mr Lighty. This little person had landed with a plop in her world, and suddenly time seemed to stand still. But time can be a very funny thing. Time is not tangible, and can be perceived differently depending on your perspective at that very point in time. Indeed, when Mrs Lighty was wading through the sea of unknown which is new motherhood, where days felt like weeks and weeks felt like months, some wise friends of Mrs Lighty told her that at one point in the not too distant future, she’d no longer feel this way. She’d grow confident with time, she’d start to enjoy the time spent with her beautiful baby, she’d definitely wonder what she did with her time before becoming a mum, and certainly wouldn’t be ready for the time when maternity leave ends and work beckons. It was, of course, all true. Before becoming a mum, I used to wonder about those Facebook posts of my mummy friends. You know the ones, the ones that say “I can’t quite believe my baby is 8, 9, 10 months old…” etc. 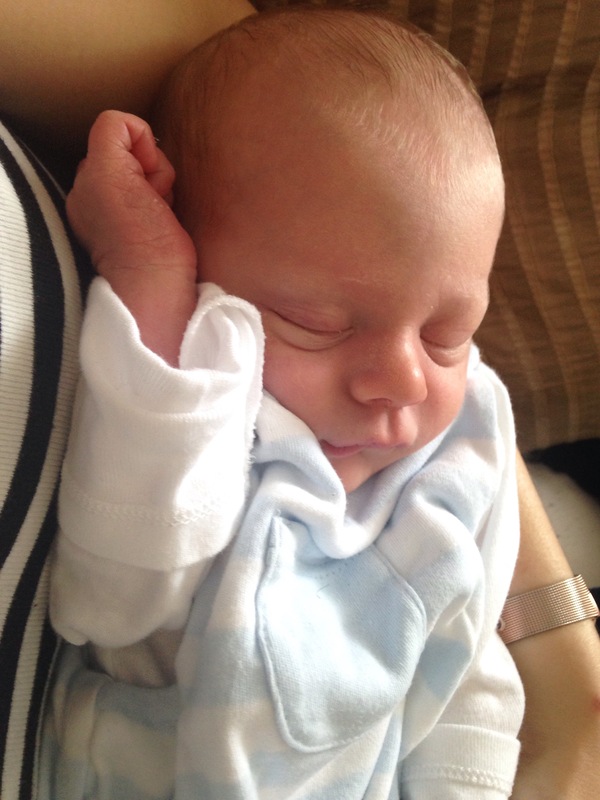 I used to wonder, because surely there was a logical explanation to how your little one gets to that age – the passing of time, of course – and also a desire to see your little one thrive and grow up? To become a happy, healthy little person and, later on, an adult in their own right? Of course, all mums want this, all mums are grateful for the passing of time in the sense that every day with their little one means another day that they are growing, hopefully healthy and strong, learning and playing and becoming their own person. But since becoming a mum, although I draw the line at subjecting my Facebook friends to a day-by-day countdown towards age milestones, I do understand why my mummy friends couldn’t always believe where the time had gone, because I now see that once you become a parent, time goes by so fast. There is a famous Gretchen Rubin quote which states that “the days are long but the years are short”. Until you are a parent, you cannot appreciate this statement. The days can be long – they can be filled with tiredness and tantrums, seemingly endless feeding and entertaining and cleaning – but the years are short. The years are short because they are filled with love, laughter and pride. In the last month, Baby Lighty has changed so much. It’s true that babies are ever-changing, but there comes a point when it’s quite clear that they are their own little person. Where they are learning every day, where they suddenly take on the characteristics of a little sponge, soaking up everything they see and are taught, and their personality starts to shine through. In the past month, Baby Lighty has become that sponge. A beautiful sponge, but a sponge all the same, taking in everything, learning so much and changing before our very eyes it sometimes seems. Not only has he hit certain milestones including crawling, cruising and taking a few steps with his walker toy, but he can also suddenly join in with the actions of Twinkle, Twinkle, Little Star and Wind the Bobbin Up, sometimes sounding like he’s singing along too; he has started to play ‘properly’, perhaps pretending to drink a cup of tea from the plastic cup in his teaset or pretending to eat his play food; if you give him a little box he’ll pretend there’s food in there, ‘feeding’ both himself and Mr and Mrs Lighty, and he has also started to make noises that sound suspisciously like actual words. I’ve started to say to Mr Lighty that we need to be filming him more, because suddenly his funny act of rolling to anything he wanted, accompanied by great facial expressions of effort, has been replaced by crawling, and I know that all too soon crawling will be replaced by walking, judging by his agility with the walker. I can’t keep all of these memories in my mind as much as I’d like. 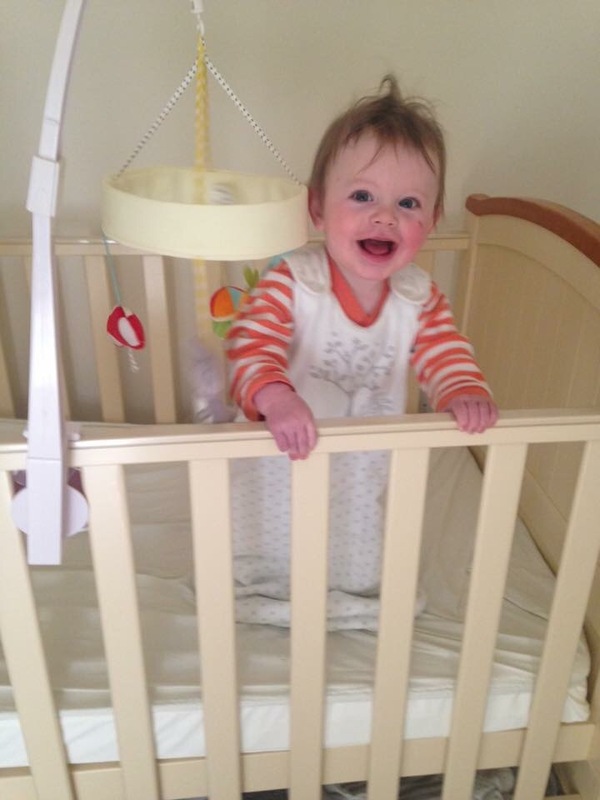 Finding Baby Lighty stood up in his cot was something of a shock!! But nothing showed me the passing of time more than the day when a then-10-month-old Baby Lighty decided that it was time to crawl out of the baby room at our Mother and Baby Group, apparently making his way into the toddler room. That was likely to be our last full session in the baby room, the baby room which we have been to almost every Thursday since he was 4 weeks old. 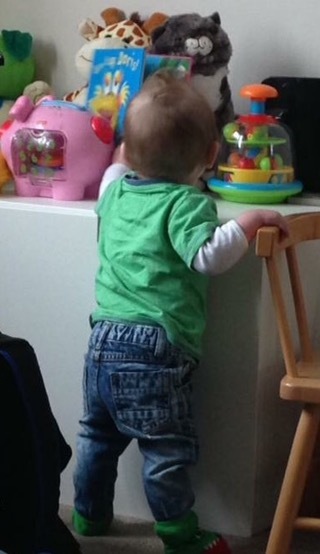 Standing up by his toy box, now that he can cruise along the furniture he often selects his own toys!! Where did that tiny 6lbs 8.5oz baby go?! Already since drafting this post the hands of time have turned again, and 10 month old Baby Lighty is now 11 months old and hurtling towards his first birthday. Suddenly I’m in possession of a toddler! Yes, the days are long but the years are extremely short, and for those mothers that are just starting out, that are in that post-birth foggy haze of sleep deprivation and not knowing quite what’s hit them, please listen to Mrs Lighty when she tells you what her wise mummy friends once told her: you will get to a point where you’re enjoying your baby so much that you don’t want to go back to work, a point where the days fly by without you really knowing what you’ve done, where you’ve had more laughter than tears, or at least had more happy tears than sad. You will get to that point for one simple reason: time really does fly when you’re having fun. Next → Next post: Motherhood: Who Needs an Endurance Race?! What a beautifully written post and it’s all so so true. That first year goes by too fast and our little ones change oh so much. I really wish I’d made more of the time Ailsa was small and easily portable but I’m loving seeing all the new things she can do now. It’s such a strange feeling. So very true! My cousin has just had a baby and I’ve found myself repeating the exact same advice to her. I love “The years are short” quote and it just sums up the whole parenthood thing perfectly.